Gov. Edgar Chatto cited his predecessors and their works in a selfless 161st Bohol Day address which many say only reaffirms the Â stature of a man humbled by the gains of his own achievements. The founding commemoration of the province on July 22 heightened different development modes in his time as aspired, began and worked on by the past leaders. â€œPerhaps, it would not be amiss to say that we do have come a long, long way. But we do also look back and thank our leaders of the olden days. All of them had led us to where we are today,â€ Chatto said. The governor led on the historic occasion varied activities that pursue the encompassing agenda for tourism, socio-economic services, health, environment and infrastructure. The triennial Tigum Bol-anon sa Tibuok Kalibutan (TBTK) formally reeled off, once again staging, after its last here three years ago, the grand provincial homecoming of no precedent in the country. Formally named thru a Sangguniang Panlalawigan (SP) an â€œadopted sonâ€ of Bohol, Australian Amb. Bill Tweddell did feel Boholano oneness at the TBTK grand welcome party and was the Bohol Day keynote speaker. The TBTK 2015 has been led by US-based Dr. Neil Bonje while the new officers for the TBTK edition in 2018 will be elected tomorrow. Chatto and Vice Gov. Concepcion Lim led provincial officials in launching the Galing Purok Award, a yearly search for best puroks, workers and practices. The top capitol officials signed the Memorandum of Agreement on Hospital Care Services with the Health Care Executives Society of the Philippines HESP), represented by its president, Dr. Richard Lirio, and past head, Dr. Jose Pepito Amores. The province launched with the Department of Environment and Natural Resources (DENR) the Integrated Natural Resources and Environmental Management Project (INREMP), which covers 17 watershed towns. DENR. Sec. Ramon Paje was represented by Usec. Demetrio Ignacio, Jr. along with Regâ€™l. Dir. Isabelo Montejo. Chatto and Tweddell led the turnover and inauguration of the Bohol Road Repair and Rehabilitation Projects (BERRRP), which have been assisted by the Australian Agency for International Development (AusAID) thru the Provincial Roads management facility (PRMF). The Australian envoy recognized Boholâ€™s PRMF experience thru road projects and capacitating institutional reforms as an inspiration to other provinces. A partnership with the province, the PRMF, which also has regular road package, is collaborated by the Department of Interior and Local Government (DILG). DILG Sec. Mar Roxas was represented by new Regâ€™l. Dir. Rene Bordeos along with his predecessor and now Region XI Dir. Ananias Viullaciorta, who was awarded a special citation for his support to Bohol governance while assigned in Central Visayas. Confident, Chatto said in his Bohol Day speech that the elected governors in recent years all contributed to the provinceâ€™s advancement, which he believes is an evolutionary process. He could speak with authority because he has worked with them in different capacities since his provincial Kabataang Karangay (KB) leadership until this date as governor. Chatto cited then Gov. Rolando Butalid who established the basis for agricultural development and in whose term came into being the Bohol Agricultural Promotions Center and Ubay Stock Farm. Ex-Gov. Constancio Torralba trailblazed tourism and infrastructure development that at his time the so-called Panglao tourism estate was drawn and Bohol cirumferential road sketched. In 1995, Bohol was ran by a â€œdevelopment teamâ€ led by then Gov. Rene Relampagos, whose vice governor was Chatto himself. Relampagos, now the First District congressman, turned up at the commemoration ceremony at Bohol Cultural Center despite his delayed flight from Manila. The then Relampagos-Chatto tandem at capitol was widely credited for crystallizing for the first time in history Boholâ€™s vision, mission and goals thru a multi-sectoral consultative process. 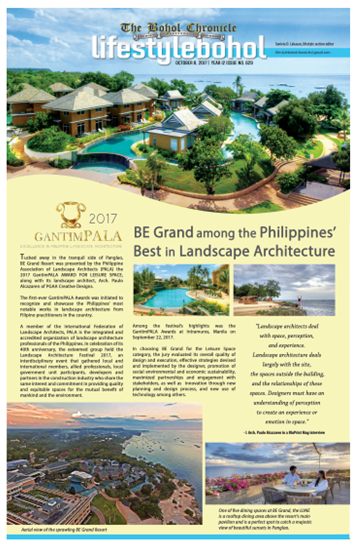 Modesty aside, Chatto said, it was the birth of the concept of ecological and cultural tourism, for which Bohol is now known worldwide. A great communicator, the late Gov. Erico Aumentado completed the circumferential road that Torralba started, and further advanced the tourism initiatives of the Relampagos-Chatto administration. Chatto was KB provincial president in Butalidâ€™s time, Balilihan mayor in Torralbaâ€™s and Bohol mayorsâ€™ league president in Tirolâ€™s, then vice governor of Relampagos, and First District congressman in Aumentadoâ€™s term. Since assuming as governor, Chatto has â€œPadayon Bol-anonâ€ his battlecry because Bohol has no other option but move forward. Third District Rep. Art Yap commended the incumbent provincial leadership for making Bohol better. As a tradition, Bohol Day marking honors, thru the Governorâ€™s Awards, deserving sons and daughters and thisâ€™ yearâ€™s recipients are Bohol Bee Farmsâ€™ Victoria Sandidge in the field of business/enterprise; Lite Shippingâ€™s Lucio Lim, Jr., public transport; Bohol Federation of Disabled Persons president Timoteo Quilas, social services; and former boxing Olympian Teogenes Peligrino. Meanwhile, Chatto announced that he and fellow governors will have a crucial meeting with Pres. Benigno S. Aquino III days after the latterâ€™s last State of the Nation Address (SONA) tomorrow, July 27. This is to make the presidentâ€™s SONA pronouncements â€œhit the ground running, especially those which directly matter and affect the development agenda of the provinces. The Bohol governor is the national secretary-general of the League of Provinces of the Philippines (LPP). Chatto has expected Aquino to articulate in his SONA the past and present gains as well as his future commitments—of direct impacts on the LGUs—for the remaining 11 months of his presidency. One major governorâ€™s league proposal inspired by Boholâ€™s PRMF experience and championed by Chatto as LPP spokesman on the particular initiative is the Provincial Road Network Development Program (PRNDP).